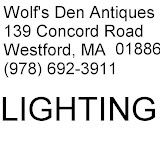 Roberta specializes in Victorian marble top furniture and accessories - lamps, pictures, wall hangings, sconces, gas fixtures. 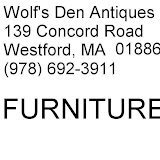 There is a good selection of mahogany bedroom, dining room sets, sofas, chairs, desks, oak bureaus, lots of brass and iron beds, bookcases, china cabinets, dishes, clocks, sterling silver, architectural items and hundreds more items that serious buyers and browsers can enjoy when they come to Wolf's Den Antiques. 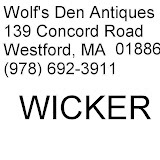 Forty minutes west of Boston.